www.ajhs.info/jha Click on the flag in top left corner to return to index page of Jewish History Australia. 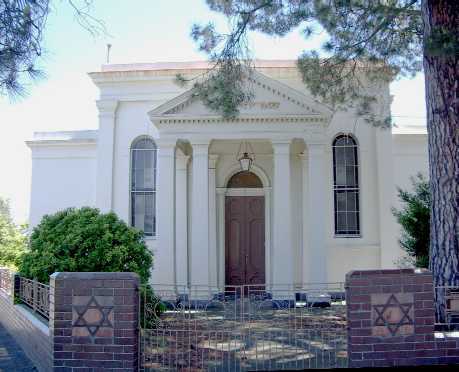 Temple Beth Israel is the oldest Liberal/Progressive synagogue in Australia. The original synagogue on this site was erected in 1939. This synagogue functioned in a converted private house from 1943 to 1987. Its Ark is now in the King David school. 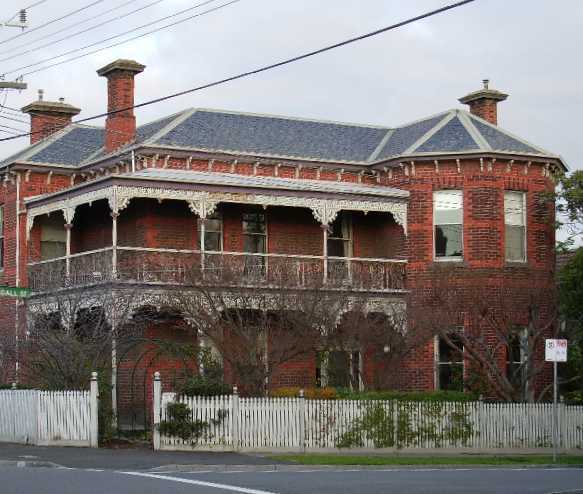 The building itself is still in good condition in Lord Street, Brunswick, serving as a private residence. 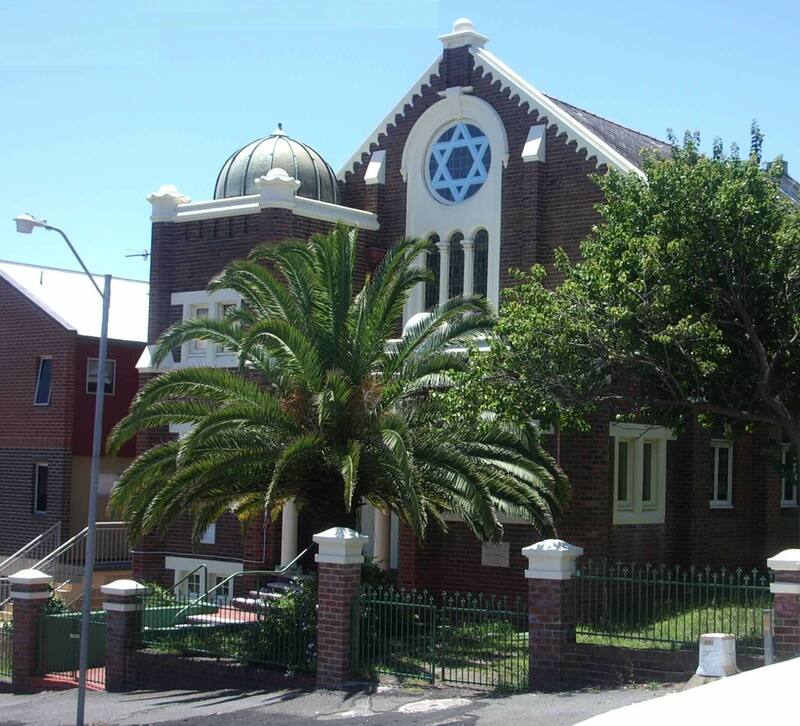 Chabad House in Melbourne is headquarters to the Lubavitcher movement in Australia. The movement has had members in Australia since the 1930's. 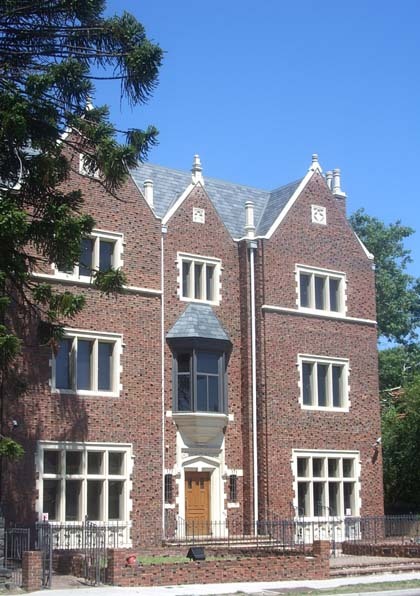 The striking building is a scaled replica of the Crown Heights, New York, centre in which the late Lubavitcher Rabbi Menachem Schneerson lived and worked. Moses Joseph born in London 1803, was sentenced for life at the Warwick assizes in 1826, arriving as a convict in Sydney in 1827. Yet this convict rose to be a respected leader of commerce in Colonial NSW, with a fleet of boats that traded through the Pacific as far as San Francisco. 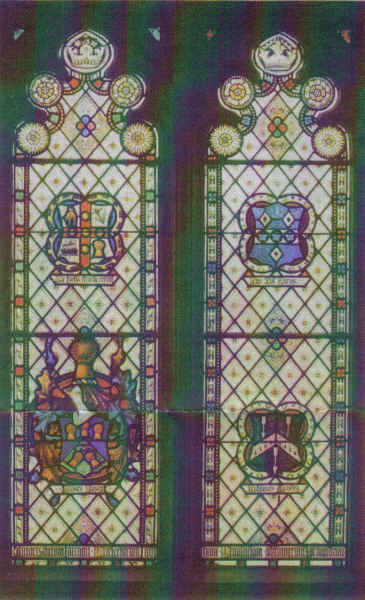 He contributed to the establishment of the University of Sydney, Australia's first university, and endowed these windows that bear his name. In his rise from hardship to wealth and status, he was supported by his childhood sweetheart, Rosetta Nathan, who followed him to Sydney. Following a petition to the Governor, she and Moses Joseph were married in 1832 in the first officially sanctioned Jewish wedding in Australia. The couple had nine children. This window is a powerful symbol of Jewish convict success in Australia, and of Jewish contribution to cultural development here. These paintings of three Victorian synagogues are from an illuminated address presented circa 1899 to Sir Benjamin Benjamins, Lord Mayor of Melbourne and a Victorian State Parliamentarian, on the award of his knighthood. These and two other historical paintings have been used by the AJHS (Vic) as the basis for a set of five most intriguing postcards. (Not available for sale online.). 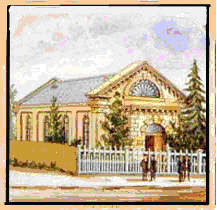 The Great Synagogue, Architects sketch. 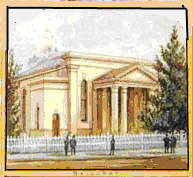 Dedicated in 1878 to replace the York Street Synagogue (built in 1844). Below: as viewed through the trees. 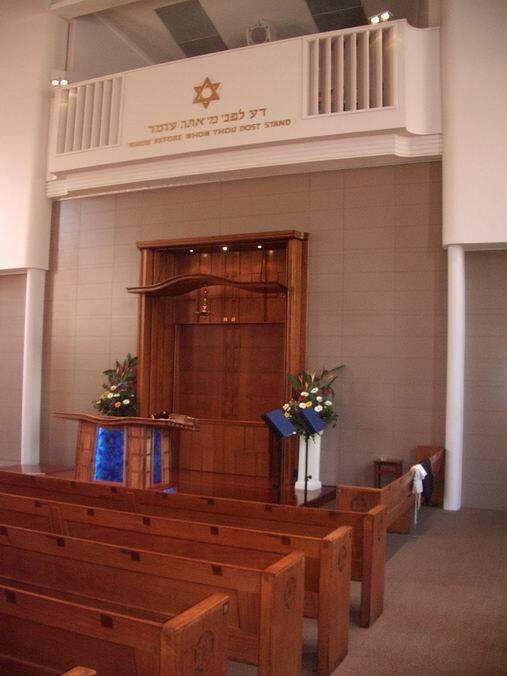 Interior of the main synagogue of Temple Emanuel, Sydney. 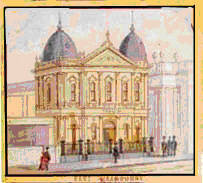 This was the first Progressive Movement synagogue established in Sydney. Today, Emanuel regularly provides, in its two synagogues, both a Progressive and a Conservative service, whilst once a month there is a Renewal service." Jews lived in Maitland from 1830 onwards. The community was active 1850-1870, though never numbering more than about 70 families. 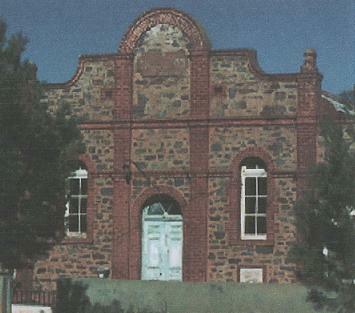 The synagogue, with foundation stone dated 1879, could seat 364, but closed in 1898. 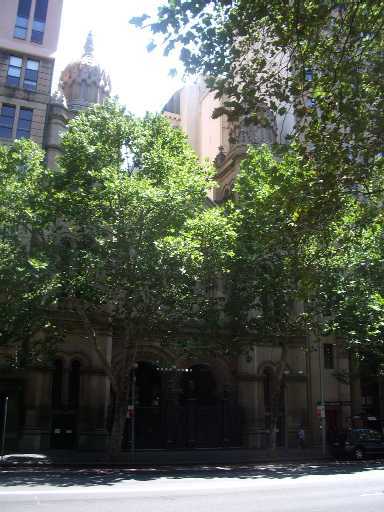 The Newcastle Synagogue is located on the edge of the CBD -- just 250 meters from the Newcastle City Town Hall. 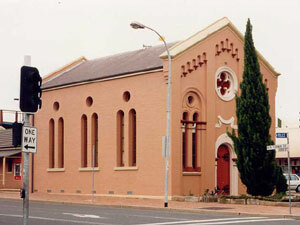 Several jewish families played a leading role in Newcastle during the colonial era, but the height of the communities growth was reached with the erection of this synagogue under the spiritual leadership of the Rev Isaac Morris around 1927. 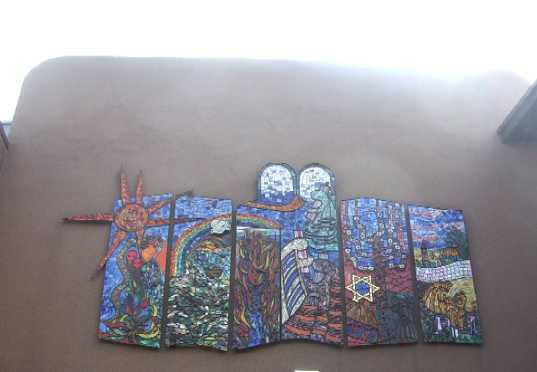 Today the synagogue functions does not have a rabbi and functions using lay leaders. However there is significant hope for the future with the forecast growth of Newcastle.